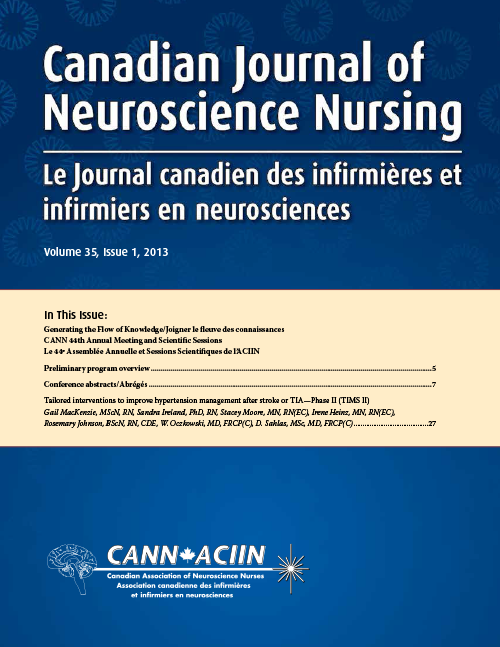 CJNN is published three times per year and posted on the Canadian Association of Neuroscience Nurses (cann.ca) website for members and subscribers. All amounts shown are in Canadian Dollars. Trim Size: 8.5 × 11"
Bleed Size: 8.75 × 11.25"
Type Page: 6.75 × 9.5"
Half-page horizontal: 6.75 × 4.75"
Half-page vertical: 3.25 × 9.5"
The official website of the Canadian Association of Neuroscience Nurses provides users with current neuroscience news, award, scholarship and bursary opportunities and timely research reports, in addition to association and membership information, relevant links and more. The site is indexed in many search sites and health sciences sites. Conferences, workshops and courses will be posted under the “Events” heading. Job postings will be listed in the “Careers” section. Corporate ads will be posted or linked as appropriate. The Canadian Journal of Neuroscience Nursing is published for the Canadian Association of Neuroscience Nurses by Pappin Communications, Pembroke, Ontario.